Arabs have once again desecrated the Tomb of Joseph in Shechem, daubing the structure with anti-Israel and anti-Semitic graffiti. Arabs have once again desecrated the Tomb of Joseph in Shechem, daubing the structure with anti-Israel and anti-Semitic graffiti, swastikas, and other symbols of hatred. Shocked visitors to the site said that it was simply an act of barbarism, that clearly showed what the fate of Jews would be if the Arabs ever do wrest control of Judea and Samaria from Israel. 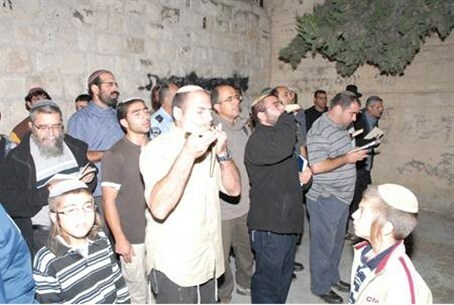 The desecration was discovered late Wednesday night, when over 2,000 Jews entered the compound in the PA-controlled city of Shechem for Selichot (pre-Yom Kippur penitential prayers). The prayer service was organized by the Samaria Regional Council and the Shechem Echad organization, which advocates a Jewish return to the city, in coordination with the IDF. The first wave of visitors saw the vandalism and alerted group leaders to the situation. Those inside the building quickly began painting over the offending symbols and comments with whitewash, while hundreds of worshippers continued to descend on the site.